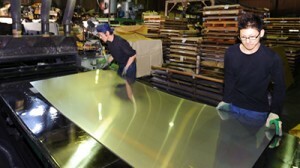 ﻿ Shinko Stainless Steel Polishing Co., Ltd. | Shinko Stainless Steel Polishing Co., Ltd. is a stainless steel polishing specialist in Kawaguchi City, Saitama Prefecture. We polish regardless of the size, and we also handle the polishing of immovable ones by visiting. Shinko Stainless Steel Polishing is a specialist in designer’s polishing in metal polishing of stainless steel and aluminium etc. From steel sheets, various pipes, flat bars to section steels, we can polish regardless of shapes. We work on normal buffing, HL, vibration, and mirror surface. On top of that, we also provide services such as reworking on processed goods and visiting to polish. We also work on colored stainless steel and alumite treatment. Please do not hesitate to contact us for anything related to polishing. At our company, original polishing popular, where we create designer's polishing mostly by hand. If you are looking for a new, designer's finishing, then please consider our original polishing.